Many morphological variables have been identified both in primary and permanent dentitions. Bolk, in 1916, was the first to describe an additional cusp formation occurring on the buccal surfaces of upper and lower permanent molars in man and he named this cusp the “paramolar tubercle.” The term “paramolar tubercle” has been applied to any stylar anomalous cusp, supernumerary inclusion, or eminence occurring on the buccal surfaces of both upper and lower premolars and molars. Dahlberg, in 1945, introduced paleontological nomenclature when he referred to this structure as “parastyle” when present in the upper molars and as “protostylid” when present in the lower molars. Parastyle may occur in both deciduous and permanent molars and are usually expressed on the buccal surface of the mesiobuccal cusp (paracone) of the upper molars. In rare instances, it is expressed on the distobuccal cusp (metacone) of the upper molars and the buccal surfaces of the upper premolars. Similarly, a double cusp formation is extremely rare. Hanihara gave a classification of protostylid, and its various types were described as follows: Type 0 – absent, buccal groove is straight and there is no trace of irregularity. Type 1 – Absent, no evidence of protostylid, but the beginning of one is suggested by the curvature and branching of the buccal groove. There may be a small, but distinct pit at the lower end of the buccal groove separating protoconid from the hypoconid and the buccal groove is slightly bent in a distal direction at the point of the pit. Type 2 – Present 1, the divergence of buccal groove is more developed than Type 3. The small triangular area with tip downward between the branches of the buccal groove. Type 3 – Present 2, the two branches of the buccal groove are more developed than Type 3. The small triangular area with tip downward between the branches of the buccal groove. Type 4 – Present 3, a very shallow groove appears at the corner of the buccal surface. The area between this groove and mesial branch of the buccal groove bulges slightly and gives triangular shape with its tip upward. Type 5 – Present 4, triangular area is more strongly developed than Type 5. Type 6 – Present 5, protostylid is strongly developed so that the tooth seems to have an extra cusp on the buccal surface. These morphological anomalies have great significance both orally and anthropologically. 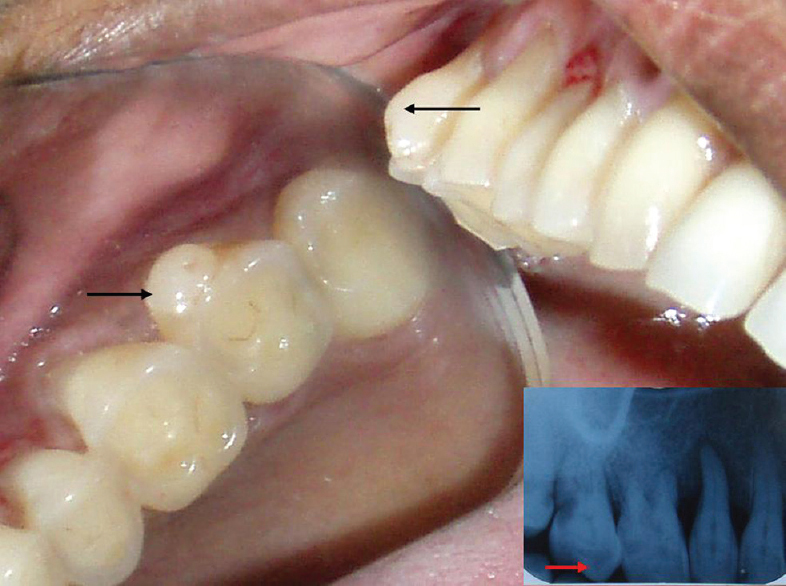 The presence of these extra cusps may have dental problems such as caries in the pits or developmental grooves between the accessory cusp and the tooth,, sensitivity or devitalization due to fracture or attrition of the protruded portion of the cusp that has pulpal extension,,, premature tooth contact that leads to occlusal interference and habitual repositioning of the jaw. Hence, recognizing anatomical variations is of great significance. The purpose of this report is to highlight the incidental finding of the uncommon dental trait, the paramolar tubercle or the Bolk's cusp, in permanent dentition. [Figure 1] shows a female patient who was referred to the Department of Periodontics for routine oral prophylaxis. Intraoral examination of the patient revealed the presence of a tuberculum pulpale on the mesiobuccal cusp of the maxillary right second permanent molar, with a pointed tip and a well-formed cusp. Inset in [Figure 1], shows a radiograph with a well-defined pulp within this superstructure (SS). Accessory cusps are common variations of tooth morphology that are occasionally seen clinically. Cusp of carabelli, protostylid, central accessory cusp, variations in the cusp number, and number of roots are all termed as “nonmetric dental traits.” The nonmetric features are recorded visually in terms of presence, absence, degree of development, or expression of nonmetric features. Bolk did not mention the pulp in his extensive studies of SS. Supernumerary cusps, or extra cusps as they are often called, are additional SS occasionally found on teeth. These SS two types are as follows: Type I – Structures of enamel and dentin which may or may not have a pulp chamber and canal and Type II – Structures composed of enamel overgrowth or prominence. Further, Type I SS having a pulp may be classified as, formation supradentalis (formation on the tooth), formation supradentalis without a root (tuberculum pulpale), and formation paradentalis. Type I SS without the pulp are formations that represent coronal units without the pulp. These features manifest themselves in two forms: Protuberantio apulpalis and Ruga adamantinea. Formation supradentalis - This form exhibits a supernumerary cusp and includes not only the tuberculum but also a supernumerary root connected with that cusp, both of which have a pulp. Both can be located on the lingual or buccal of the crown in either upper or lower dentitions. Supernumerary roots without a cusp do not fall into this category. Formation supradentalis without a root (tuberculum pulpale), when situated on the mesiobuccal side on the upper molars, has been termed by Bolk as “tuberculum paramolare.” These are very well-developed cusps standing independently and well separated from the buccal surface by a distinctly expressed groove. They are located between the buccal cusps of the tooth or can emerge either mesiallv or distally. It should be mentioned that every so-called tuberculum pulpale cannot always be determined with accuracy as really having a pulp. In cases, where tuberculum pulpale is strongly pronounced the presence of pulp may be presumed. Periapical radiographs have been of little significance in assessing the internal structure of the paramolar tubercle as it superimposes on the normal anatomy of the tooth. In these areas, spiral computed tomography (SCT) or volume acquisition CT has proved to be a useful diagnostic tool. It was previously presumed that tuberculum paramolare is only a rudiment of the deciduous predecessors of the second and third permanent molars. However, since permanent molars have no predecessors, these elements were described as the consequence of a superproduction of the germinal tissue. In developing teeth, epithelial signaling centers, the enamel knots, form at future cusp positions and are the first signs of cusp patterns that distinguish species. Enamel knot signals, together with mesenchymal signals, regulate the patterning of the cusps and hence the shape of the tooth crown. Factors that induce knot cell differentiation may include ActivinβA and bone morphogenetic proteins (BMP), which induce the expression of the cyclin-dependent kinase inhibitor p21, one of the first differentiation markers of knot cells. This inductive potential might be regulated in vivo by inhibitors, such as ectodin, BMP-3, and follistatin. It has been proposed that BMP-4 affects cusp patterning through regulating the timing and rate of differentiation. However, the extra cusps could also be explained by ActivinβA's promoting of cell proliferation, leading to spontaneous cusp induction. At present, cusp patterning seems to be a dynamic process regulated by the whole developmental history of the tooth. The occurrence of paramolar tubercle is relatively uncommon. They usually present unilaterally in the permanent dentition. The occurrence of this structure is very low in upper first molars (0%–0.1%) as compared with upper second molars (0.4%–2.8%) or upper third molars (0%–4.7%) in all the given populations. Due to its low prevalence, there is limited information available about the anatomical and morphological characteristics of these tubercles or its relation with the pulp chamber and root canals of the tooth with which it is associated. Bolk reported that paramolar tubercles in maxillary molars tended to unite at the root but that those in mandibular molars tended to possess their own roots. He also stated that a paramolar tubercle was always united with the anterior buccal cusp of the molar and its roots were attached to mesiobuccal roots. In addition, he even reported that the paramolar root was often present without the tubercle in lower molars. Formation paradentalis - It has been so termed, because of its position. This subclass is a denticle occurring adjacent to but not connected with the upper or lower molars. These paradental formations can be found in either the upper or lower arch, buccal or lingual, between the first, second, and third molars and may be either sharp or blunt. It is sometimes similar in form to a premolar but has no connection with the molar. This structure has probably developed by the independent action of the accessory dental lamina. SS without the pulp is not a product of the dental lamina. They are built up either exclusively of enamel or also of dentin. According to their outer morphological appearance, such features give the impression of an enamel protuberance, although they may also have a dentin basis. The paramolar tubercles are clinically relevant as they influence treatment modalities in many dental disciplines. During orthodontic treatment, paramolar tubercles, interfere with cementation of the brackets, and correct alignment of orthodontic archwires and thus often necessitates its removal by ameloplasty. These SS are potent sites for plaque retention, as maintenance of oral hygiene in these areas is difficult and recurrence of dental caries, gingival inflammation, and localized periodontitis is often more possible. In addition, a tubercle that projects from the tooth or the alveolus may coincide with the recession of the gingiva, a lowered buccal alveolar bone level or both, leading to deterioration of surrounding periodontal health. When the pulp is present in a paramolar tubercle, the relationship between the pulp of the tubercle and that of the tooth must be determined. When the canal of the tubercle is connected with the main canals, then both should be treated at the same time. Thus, the existence of a tubercle and an additional root canal presents a special problem in endodontic therapy. Paramolar tubercle is an additional cusp occurring on the buccal surface of a permanent maxillary molar. Due to their overall low occurrence, there is limited information about the root anatomy of paramolar tubercles. Periapical radiographs do not always image the root canal associated with the paramolar tubercle. In view of the clinical relevance, teeth with paramolar tubercle can promote problems such as dental caries, gingivitis, periodontitis, and may pose problems to the clinician in procedures such as orthodontic banding and rubber dam placement. Although small paramolar tubercles may not have pulp tissue, a very large tubercle may contain separate pulp chamber and associated root canal. For successful management of such teeth requiring endodontic or periodontal therapy, advanced radiographic diagnostic aids such as SCT or volume acquisition CT should be used. Bolk L. Problems of human dentition. Am J Anat 1916;19:91-148. Dahlberg AA. The evolutionary significance of the protostylid. Am J Phys Anthropol 1950;8:15-25. Dahlberg AA. The paramolar tubercle (Bolk). Am J Phys Anthropol 1945;3:97-103. Kustaloglu OA. Paramolar structures of the upper dentition. J Dent Res 1962;41:75-83. Hanihara K. Classification of crown characters of the human deciduous dentition. J Anthropol Soc Nippon 1961;69:27-45. Scott GR, Turner II. The Anthropology of Modern Human Teeth: Dental Morphology and its Variations in Recent Human Populations. Cambridge: Cambridge University Press; 1997. p. 35-7. Nirmala SV, Challa R, Velpula L, Nuvvula S. Unusual occurrence of accessory central cusp in the maxillary second primary molar. Contemp Clin Dent 2011;2:127-30. Rusmah, Meon. Talon cusp in Malaysia. Aust Dent J 1991;36:11-4. Shay JC. Dens evaginatus: Case report of a successful treatment. J Endod 1984;10:324-6. Stecker S, DiAngelis AJ. Dens evaginatus: A diagnostic and treatment challenge. J Am Dent Assoc 2002;133:190-3. Hattab FN, Yassin OM. Bilateral talon cusps on primary central incisors: A case report. Int J Paediatr Dent 1996;6:191-5. Bolk L. Uberzahlige Zahne in der Molargegend des Menschen. Dtsch Monatsschr Zahnheilkd 1914;32:197. Kallay J. Extra cusp formation in the human dentition. J Dent Res 1966;45:1381-94. Kassai Y, Munne P, Hotta Y, Penttilä E, Kavanagh K, Ohbayashi N, et al. Regulation of mammalian tooth cusp patterning by ectodin. Science 2005;309:2067-70. Thesleff I, Keränen S, Jernvall J. Enamel knots as signaling centers linking tooth morphogenesis and odontoblast differentiation. Adv Dent Res 2001;15:14-8. Penttilä E, Jernvall J. Dynamics of cusp pattern regulation. Eur Cells Mater 2007;14:120. Nayak G, Shetty S, Singh I. Paramolar tubercle: A diversity in canal configuration identified with the aid of spiral computed tomography. Eur J Dent 2013;7:139-44. Ohishi K, Ohishi M, Takahashi A, Kido J, Uemura S, Nagata T, et al. Examination of the roots of paramolar tubercles with computed tomography: Report of 3 cases. Oral Surg Oral Med Oral Pathol Oral Radiol Endod 1999;88:479-83.